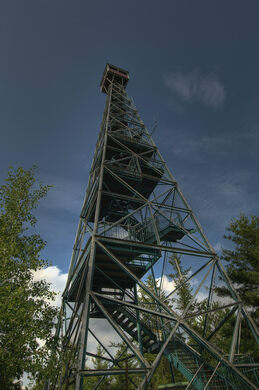 The 100 feet high, Temagami Fire Tower stands on the summit of Caribou Mountain, 400 feet above the town and 1300 feet above sea level. It is just 1/2 mile from Ontario’s historic Yonge Street (Highway 11 ) and is the highest lookout point along this route. These strikingly barren, rolling red hills were caused by bad farming practices. 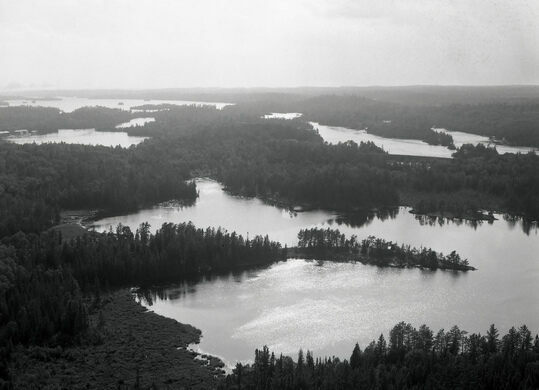 The cupola at the top of the tower commands a view in excess of 25 miles, overlooking Finlayson Provincial Park, the White Bear Forest with its stands of old-growth pine and the town’s Portage Bay, its floatplane base and water traffic. Remnants of the historic Ferguson Highway and the sites of old mining and logging operations can also be identified from atop the tower. Before the present steel tower was erected, the park went through a number of other towers that didn’t hold up. The original tower from 1910 was built of square timber and was 45 feet high but demolished only 20 years later. The next tower in line was an 85-foot high steel tower that rusted and was subsequently thrown off of a cliff. With the old 85 foot tower removed, the current 100-foot high steel tower was erected. 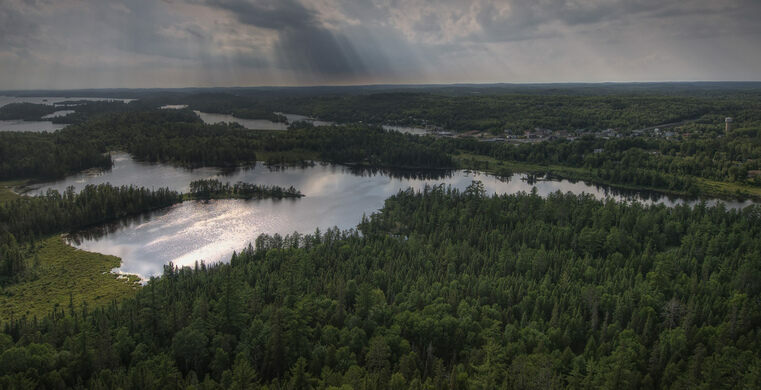 The Temagami Fire Tower was last used 25 years ago to spot fires and for the past 47 years has been a part of Temagami’s skyline, greeting the sunrise each morning. Heading North along Hwy 11 turn right onto O'Conner Dr, then another right onto Jack Guppy Way. Follow until the end park and hike up to the tower. A long-abandoned provincial prison left to crumble in the frigid air of Ontario. This stone tower in a small town's graveyard looks as though it would be more at home in a fairy tale.